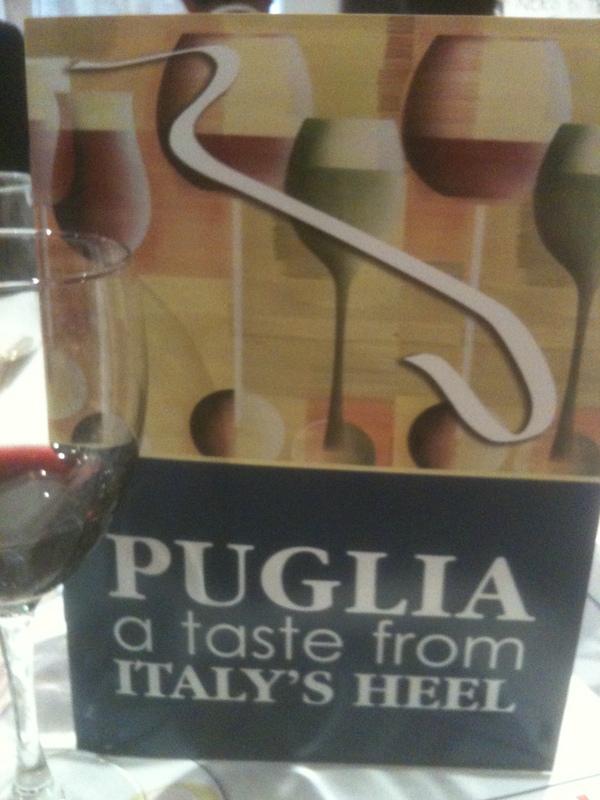 I have always enjoyed the wine and food of Puglia since my first visit there over 30 years ago. It was then that I first tasted Primitivo, Salice Salentino, and orrechiette with broccoli rabe among other great local dishes. A number of years later I became the wine director for I Trulli in Manhattan. The restaurant specialized in the wine and food of Puglia and our list featured the largest number of wines from Puglia in America. Most of the food on the menu was from that region, too. 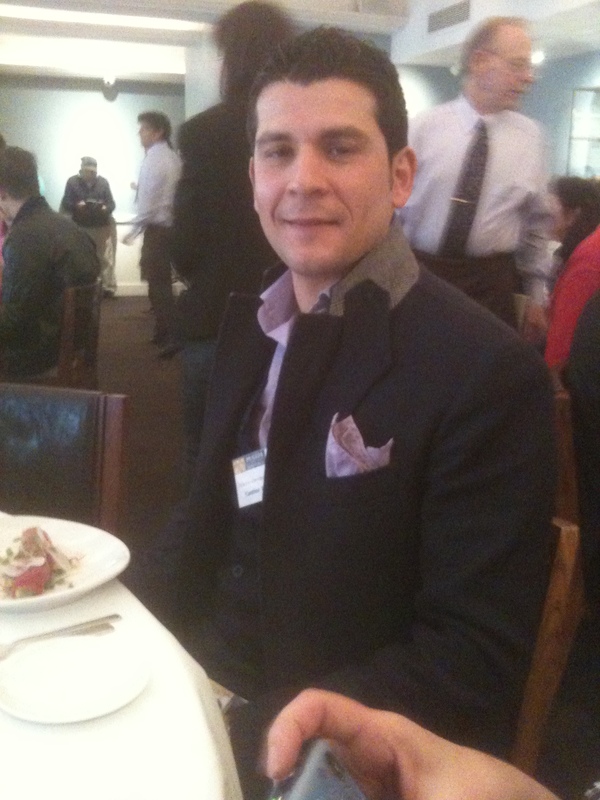 The moderator of the panel was Anthony Giglio. The panel included four producers whose wines were being presented: Beniamino D’Agostino, owner of Cantina Botromagano (a privately owned Cantina Sociale), Alberto Longo, the owner of Masseria Celentano-Alberto Longo, Donato Antonio Giuliani, the winemaker at Cantina Teanum, and Antonio Gargano, President and CE0 of Casaltrinita (Cantina Coop). 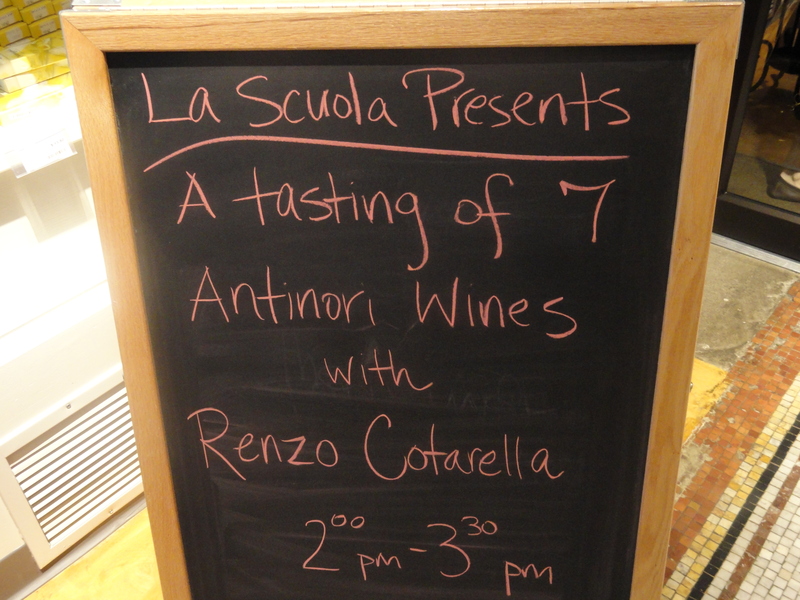 Anthony said that all of the wines in the tasting were $20 or less and represented very good value. After tasting the wines I had to agree with him. Greco — Its origin is Greece and it was first cultivated in Calabria and then in Campania and Puglia. Moscato– It is Greek in origin and is widely present in the Mediterranean basin. It might be related to the Greek Anathelicon Moschaton and the Roman Apianei. Malvasia Bianca –Most likely from the Morea area of Greece. Aglianico — It may be Greek, or from ancient Phoenicia, or more precisely, Euboes ( see www.dobianchi.com for more information). It is used to make Taurasi in Campania and Aglianico del Vulture in Basilicata and is also found in Puglia. Nero di Troia (Uva di Troia) — May have come from Asia Minor or is native to the commune of Troia (Foggia) in Puglia. Primitivo — DNA testing indicates that it came from Croatia and is related to the Zinfandel grape. It may have been introduced by Benedictine monks into the hilly area of Gioia del Colle in Puglia. Montepulciano — The origin of this grape variety is not really known, though it is the second-most commonly grown indigenous grape planted in Italy (Sangiovese is #1). In response to a question on how the wines were aged, all of the panelists agreed that the use of all new oak was not good because the wine would lose its identity. They use a combination of new oak (barriques–225 liter barrels), second and third passage, tonneaux (500 liter oak barrels) and stainless steel to age the wine, depending on the producer. Mr. Giuliani, in response to another question about the alcohol in the wine said that high alcohol is not a problem in the northern part of Puglia. If I understood him correctly he said that there is always a wind that blows across the land and unlike other places, it is cooler inland than it is by the sea. This would not be true of the Salento area in the south of Puglia which is much hotter. All of his wines were 13.5% alcohol. 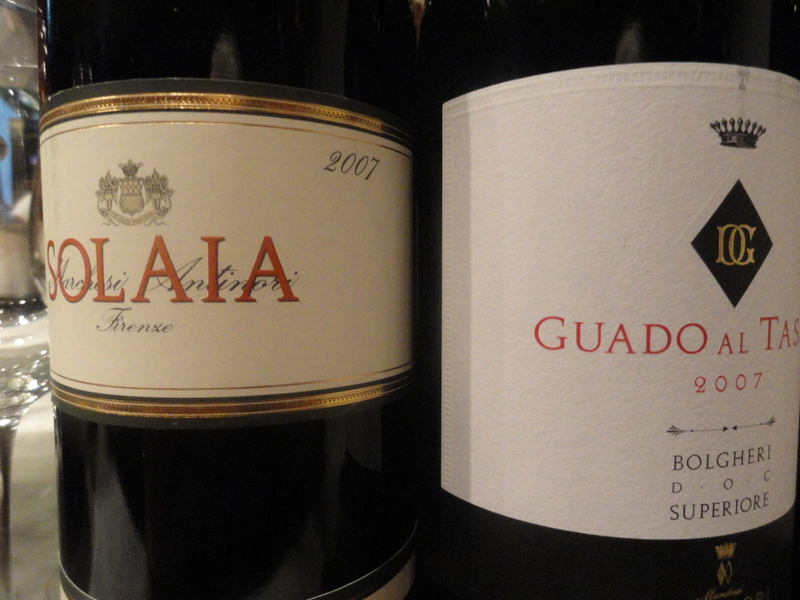 I was sitting at the same table with Mr. Giuliani at lunch and we spoke some more about his wines. I have known Beniamino D’ Agostino for a number of years and I visited Cantina Botromagno in November and spent time talking to him. He is very knowledgeable and informative. I first met and tasted the wines of Alberto Longo at Keste Pizza and Vino in NYC after Vino 2010 and was very impressed with his wines. From speaking with him, I found that not only does he have a great passion for the wines of Puglia but also for the food and the land itself. 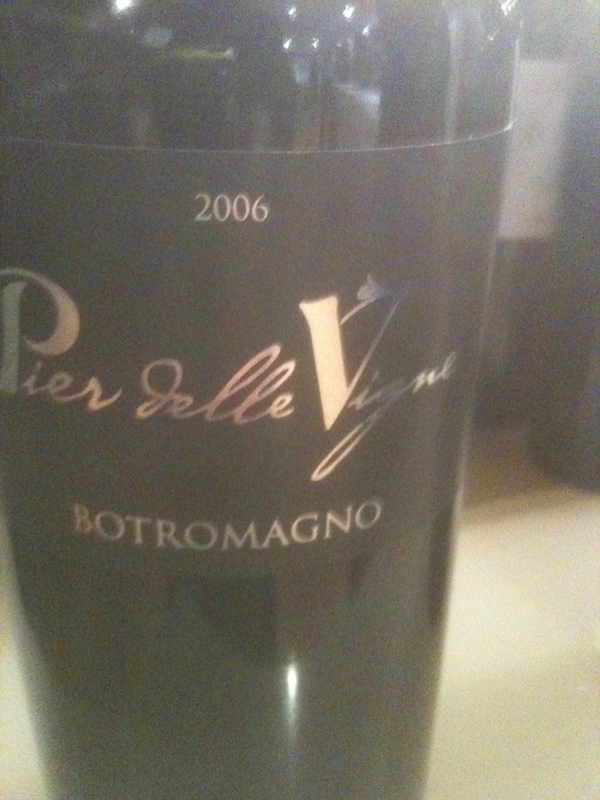 Pier delle Vigna Rosso Murgia IGT 2006 60% Aglianico and 40% Montepulciano Cantine Botromagno. The production area is the border area between Matera and Gravina. The vine training system of the Montepulciano is spur-pruned guyot and for the Aglianico, it is alberello-self supporting bush trained vines. There are about 4,000 plants per hectare and the harvest is in late October. The wine spends 24 months in new French Allier 225 liters oak barrels (barriques) 50% new and 50% once used. It is aged in bottle for a year and then released. 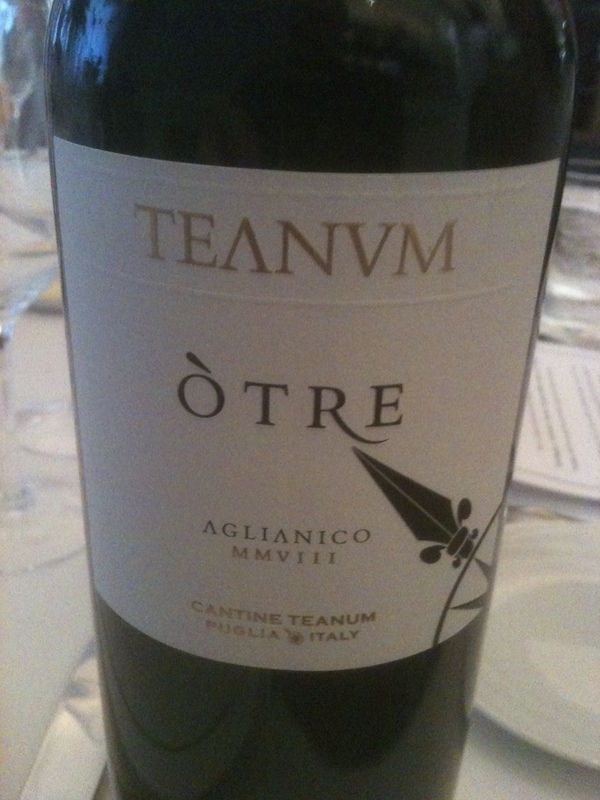 I tasted this wine’s same vintage when I was in Puglia and again my tasting notes are similar. This is a more modern style wine with aromas and flavors of red and black berries, pepper and a hint of tobacco. Greco Puglia IGT 2010 100% Greco Casaltrinita 2,500 vines per hectare and trained with the apulian vine trellis and guyot. The harvest takes place in the first ten days of September. The grapes are gently de stemmed and pressed. The alcoholic fermentation is carried out in stainless steel tanks; I do not think that malolatic fermentation took place. The wine was kept on the fine lees for three months. The wine has aromas and flavors of citrus fruit and a touch of almond the same way I described it when I tasted it in Puglia. 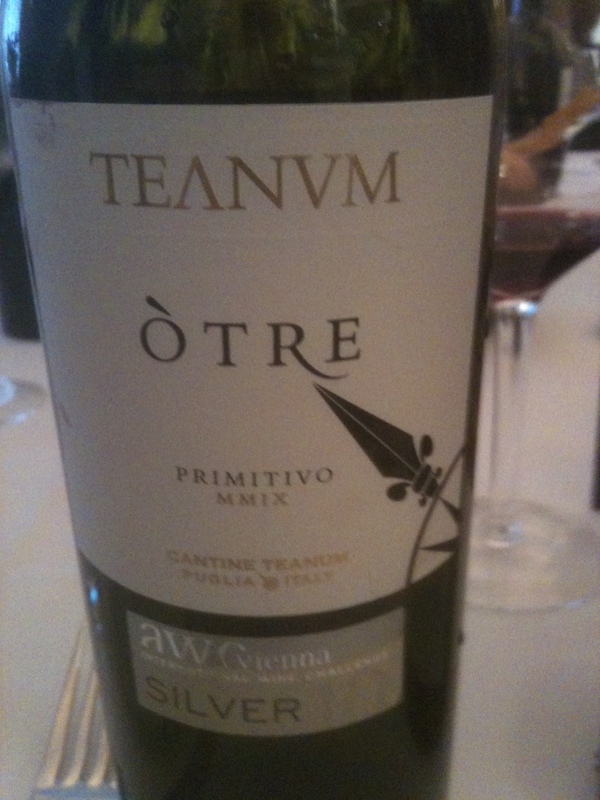 Otre Primitivo Puglia IGT 2008 100% Primitivo Cantine Teanum The grape harvest took place between the 15th and 16th of October. 27 days of prolonged maceration of the wine on the skins in stainless tanks. Maturing and aging in French oak and stainless steel and in the bottle. This is a full bodied wine with hits of dried fruit. Querciagrande Puglia IGT 2009 100% Nero di Troia Masseria Celentano-Alberto Longo Production zone: Settentrional Apulia. There are 5,600 vines per hectare and the training is spur-pruned cordon. The harvest takes place in the beginning of September. Fermentation is in stainless steel with prolonged skin contact. After malolaiic fermentation the wine is aged in French oak barriques and tonneaux for about 18 months. 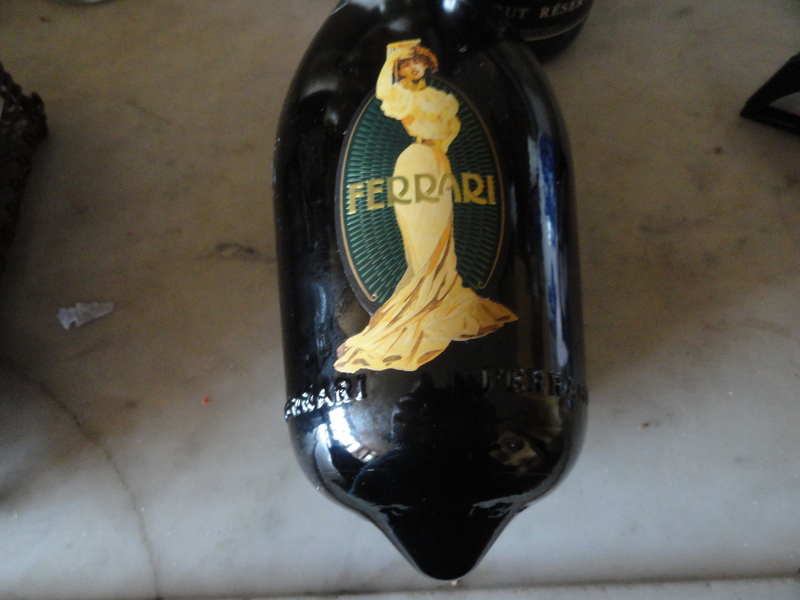 Of the three wines made from Nero di Troia, this was the biggest and a little more modern in style. 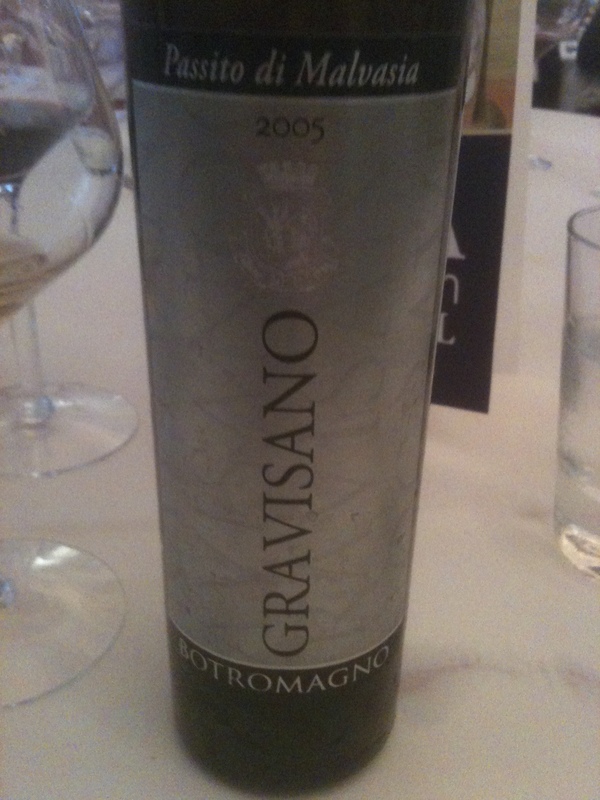 Gravisano Malvasia Passita Murgia Bianco IGT 2005 100% Malvasia lunga. 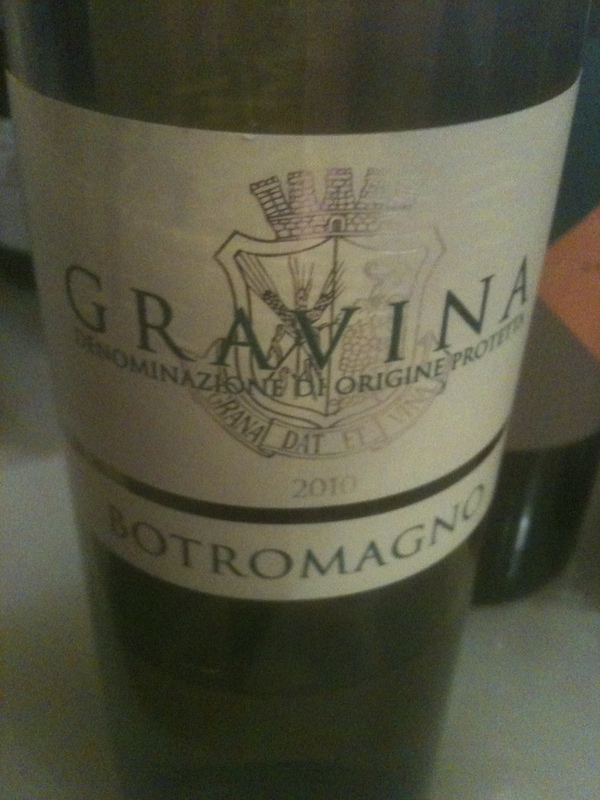 Cantine Botromagno. Production area is the best vineyard in Gravina and Spinazzola. There are 4,500 vines per hectare and the training system is Guyot. The harvest is in mid-October. The grapes are sun-dried on reed mats. The wine spends 30 days in New French Allier 225-liter oak barrels (barriques) at 16ºC and in stainless steel tanks for 12 months. This is a traditional wine in the area and it was once made with the ancient Gravisano grape that long ago became extinct. Nice way to end the lunch with a dessert wine that was not too sweet with hints of toasted almonds apricots and honey. There was no theme for this meeting of the League of Gentle Men. Each member brought a wine that they particularly liked to share with the group. Unfortunately two of the wines this evening turned out to be corked. As is our custom we begam with Champagne. I was looking forward to this wine because I have not had the pleasure of drinking it before and 2002 was a great vintage in Champagne. 2002 Pierre Gimmonet & Fils Champagne – Made from 100% Chardonnay grapes from the Cotes des Blances. This was a great way to start off the evening. The wine was drinking very well with nice fruit and a mineral character that put everyone in the right mood for the wine and food that was to follow. 1993 Rene & Vincent Dauvissat “Les Clos” Chablis A great wine from the best of the grand cru vineyards and an outstanding producer. 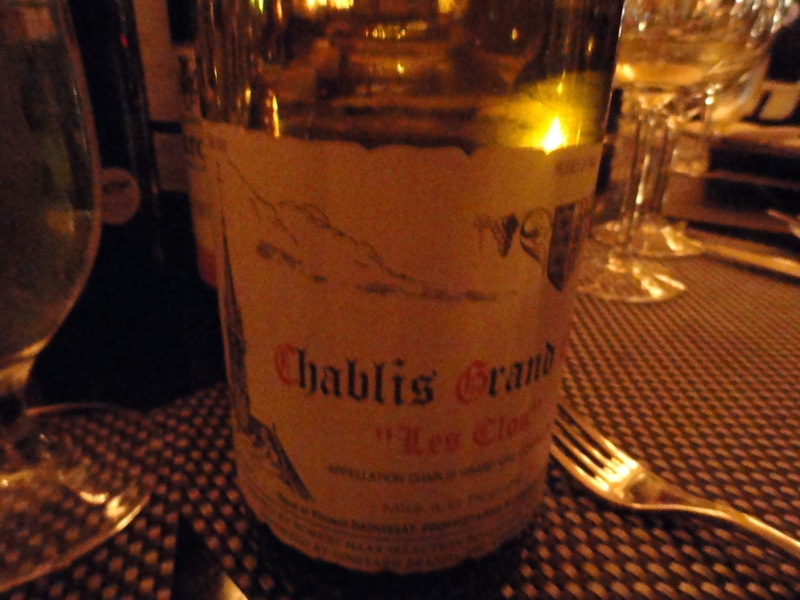 Classic Chablis and one of the best I have ever tasted! 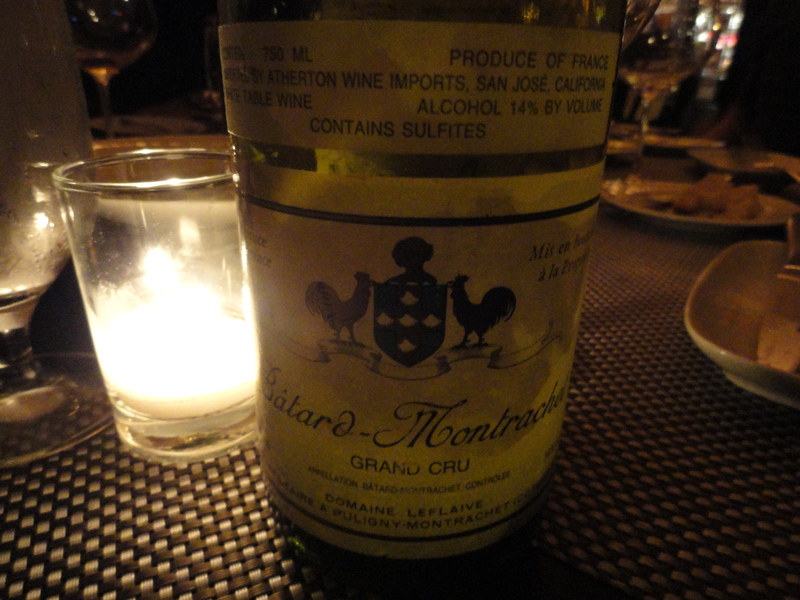 1992 Batard-Montrachet Domaine Leflaive This is a great white wine from one of the best producers. It was rich and delicate at the same time with hints of butterscotch. 1989 Beaucastel– Chateauneuf-du-Pape One of our members loves this producer, but the wine was corked, a great disappointment. Barolo 1983- Marchesi di Barolo 100% Nebbiolo. 1983 was a very good but not great vintage. The producer owns vineyards in the Barolo area but I am not sure if some of the grapes were purchased. 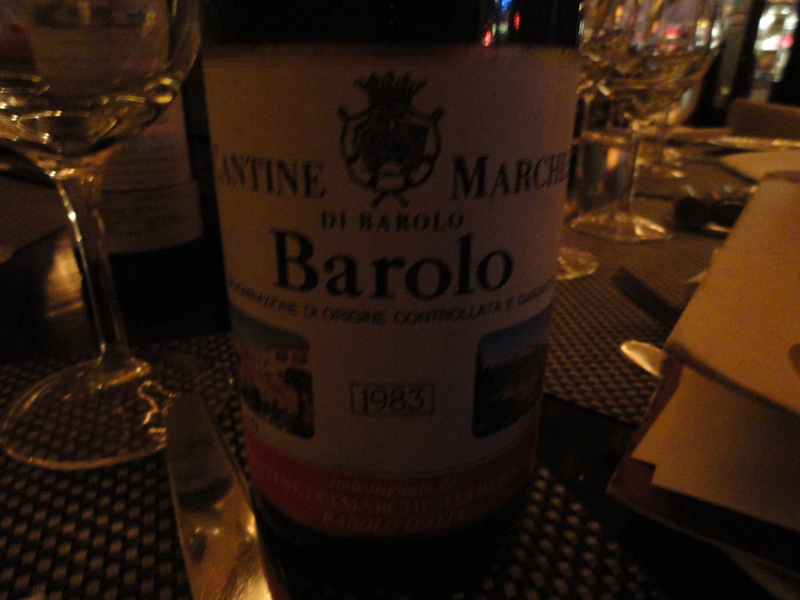 The wine was drinking very well and it had all the classic aromas and flavors of an old Barolo, including tar, leather, and tea, without showing its age. 1987 Chateau Latour (Pauillac) made from 75 % Cabernet, 20 Merlot and the rest Cabernet Franc and Petit Verdot, the blend depending on the vintage. 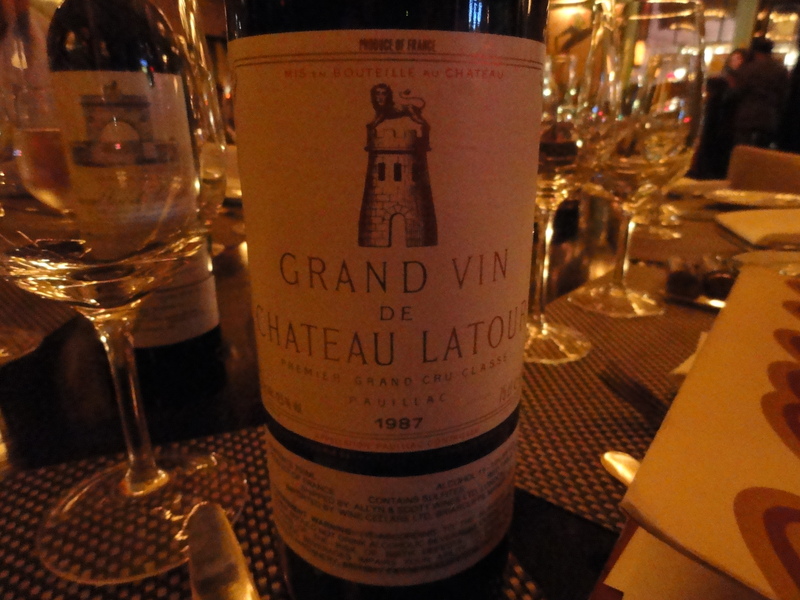 I first began to drink Chateau Latour in 1968 with the 1963 vintage. 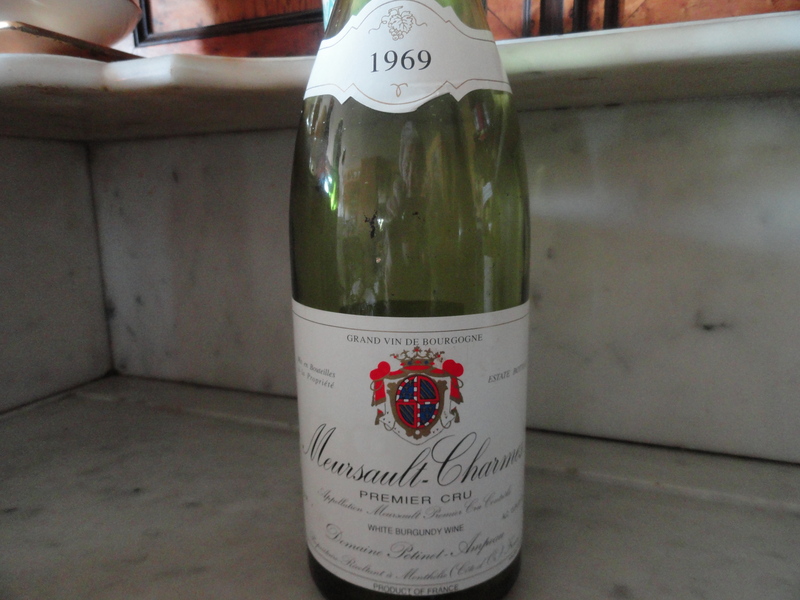 1963 was a very poor vintage in Bordeaux and the wine was selling in a wine store in Brooklyn for $3.99. For that price I bought a number of bottles and would drink them only with my then girlfriend, now wife, who was very impressed. I still remember the aroma of the Latour when I opened the bottle. It wasn’t until later that I learned that Latour makes great wine even in off vintages. It has been my favorite Bordeaux ever since. It did not disappoint. 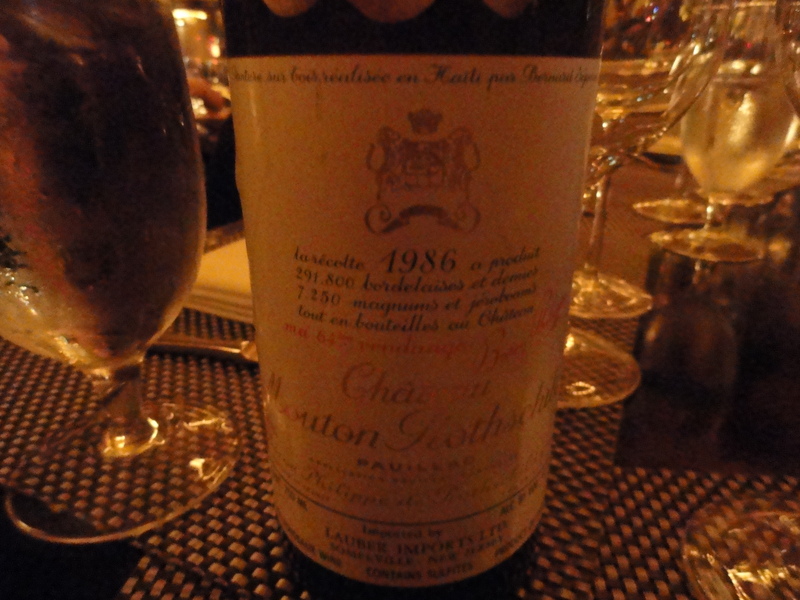 1986 Mouton Rothschild (Pauillac) made from 85% Cabernet Sauvignon, 10% Cabernet Franc and 5% Merlot. 1986 was a very good year in Bordeaux and the wine was showing very well. 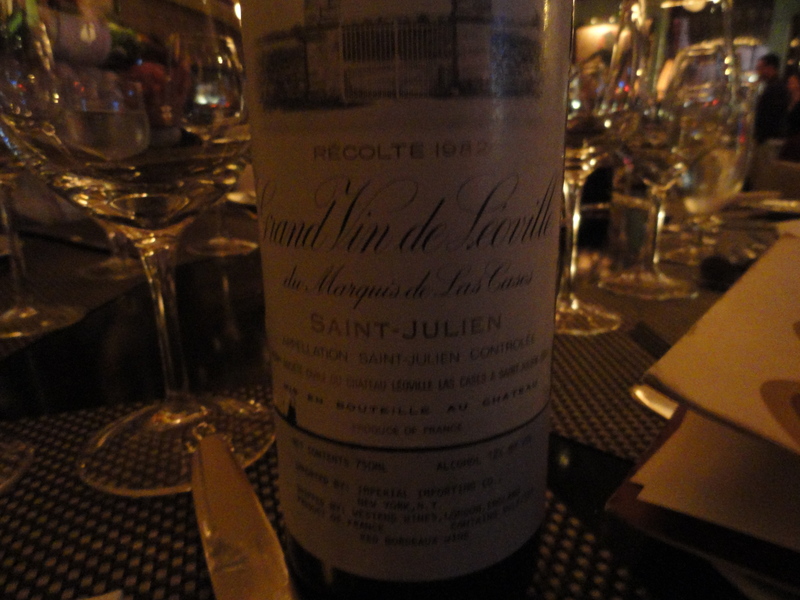 1982 Léoville Las Cases (St.Julien) Cabernet Sauvignon 65%, Merlot 17% Cabernet Blanc 13% and Petit Verdot 5%. This wine for me was the red wine of the evening, a great wine in a great year. 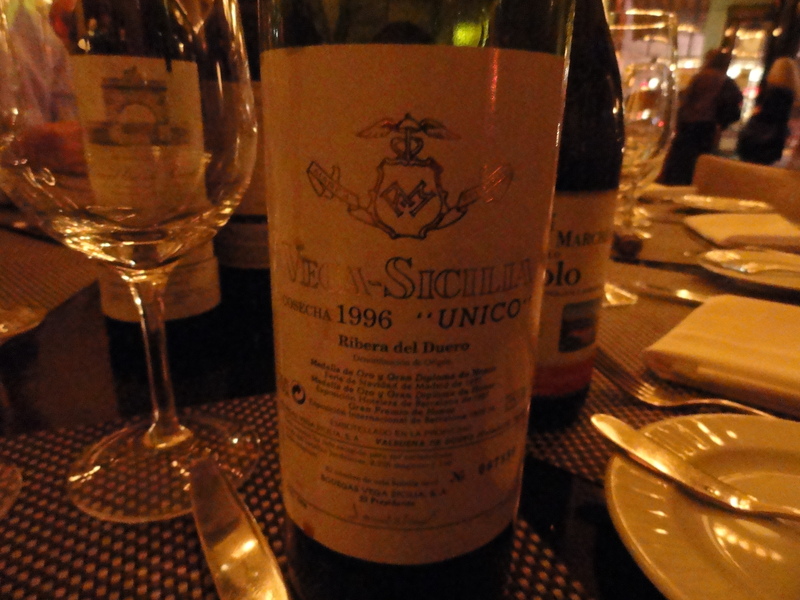 1996 Vega Sicilia Unico-Ribera del Duero made mostly from Tempranillo and Cabernet Sauvignon and produced only in good years and aged a minimum of 10 years before release. This wine is aged in new French oak and new and used American oak for at least seven years and in bottle for about three years. This was a big wine but much too modern in style for my taste. 1953 Coteaux de Layon Moulin Touchais (Anjou) 100% Chenin Blanc This was one of the wines I was looking forward to tasting but it was corked, another disappointment. 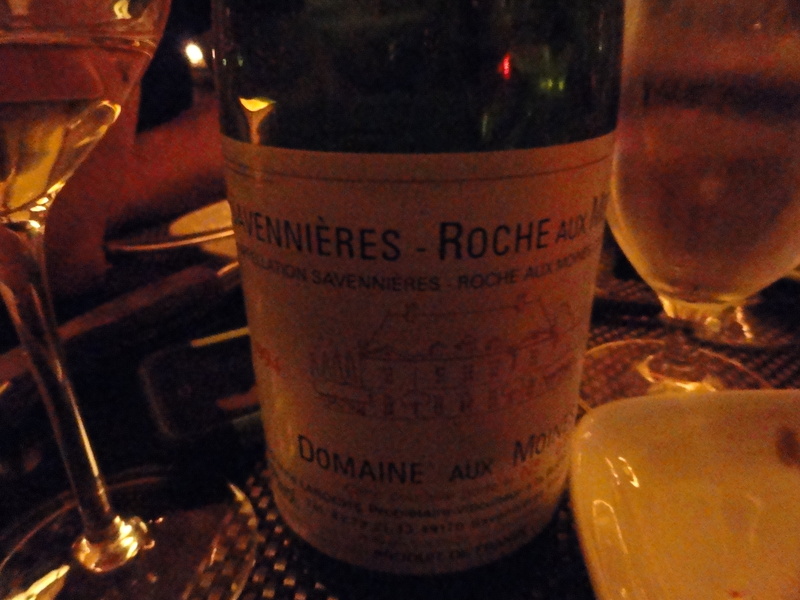 1994 Savennieres – Roche Aux Moines, Domaine Aux Moines(Anjou) made from 100% Chenin Blanc. The soil is clay and shale. After pneumatic pressing fermentation takes place in stainless steel tanks, aging is stainless steel with a very limited use of new oak. This was a very interesting wine with a lot of flavor and fruit but with a dry finish. It seems to me that with the exception of the Chianti Classico sub-zone, Chianti DOCG has an identity crisis. The Chianti Classico sub-zone is the “original” zone between Florence and Siena. It has its own Consortium and since 2005, when the government seal is put on a bottle it includes the Gallo Nero (black rooster) symbol. 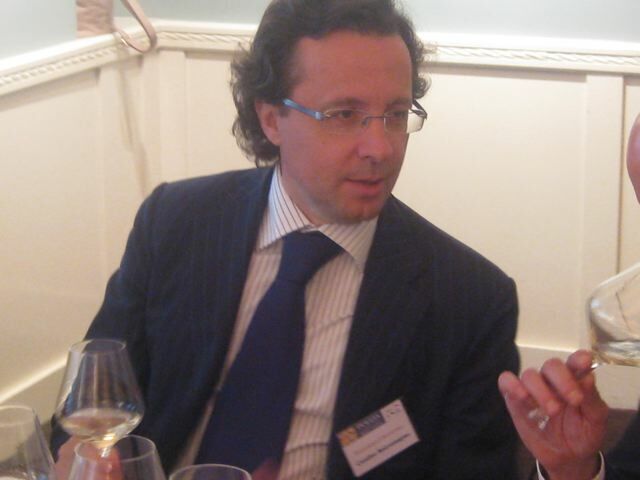 The Classico Consortium seems to want to distant itself from the rest of Chianti. 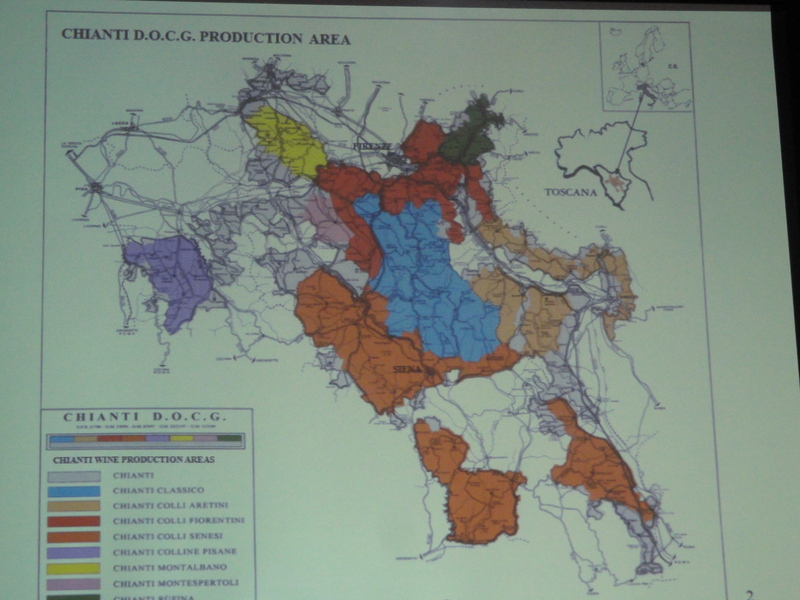 The other Chianti sub-zones joined together to a formed their own Consortium, called IL Consorzio Del Chianti Putto. Its symbol was a cherub draped in grapes. I say “was” because IL Consorzio Del Chianti Putto does not exist anymore nor does its symbol. 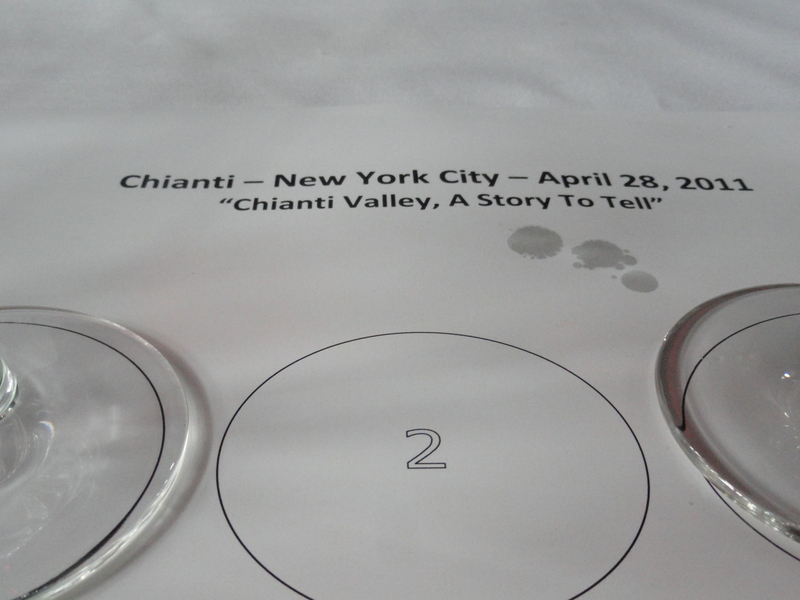 When I was invited to attend a seminar and tasting by the Consorzio Vino Chianti, I was very interested in attending. How was this “new” Consortium going to promote Chianti and make it less confusing for the consumer? So many sub-zones, so many different grapes, the rules changing too often (adding new sub-zones, changing the grapes that can be used and the percentage of grapes). With 2,650 members in the Consortium, they have a big job in front of them. The panel for the seminar was made up of Giovanni Busi, president of the Consorzio and owner of the Travignoli winery, Nicola Marzovilla, Giovanni’s importer and translator, Laura De Pasquale from Palm Bay international and wine writer Bill Marsano. 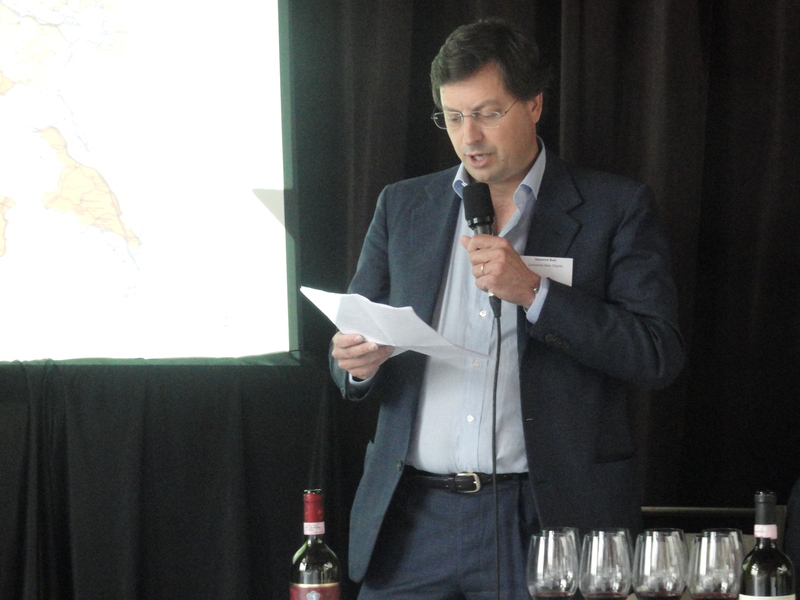 The moderator was Robin Kelly O’Connor of Christie’s fine wine auctions. After the introduction and some background information, Mr. O’Connor asked Mr. Busi to speak about Chianti and the Consorzio. Mr Busi began by speaking about the Chianti sub-zones that were members of the Consortium. The Chianti production zone consists of areas which are determined by Italian law in the provinces of Arezzo, Florence, Pisa, Pistoia, Prato and Siena. Giovanni said that he viewed the whole area as one large “Chianti Valley” characterized by hills with large terraces and valleys crossed by rivers. The wine can just have Chianti on the label or have one of the seven designated zones: Colli Aretini, Colli Fiorentini, Colli Senesi, Colli Pisane, Montalbano, Rufina, Montespertoli. In addition there is the Colli Dell’Etruria Centrale as well as the return of the Superiore classification. The Colli Dell’Etruria Centrale area is everything that has been left out of the other areas and at the same time included in them-I think? The designation is positioned alongside the Chianti DOCG and permits the production in the same area of wines of a different quality from Chianti, with red wines being joined by white, rose, novella and Vin Santo del Chianti. Chianti can be 70-100% Sangiovese, a maximum of 10 white grapes (Malvasia and Trebbiano) and 15% of authorized red grapes such as Cabernet, Merlot and Syrah. Chianti Superiorecan be produced in all of the Chianti sub-zones with the exception f Chianti Classico. Producers in these other sub-zones can make a Superiore but it cannot have the name of the sub-zone on the label. Superiore means that it has higher quality standards like lower yields and higher alcohol. It can be 75-100% Sangiovese, a max. of 10% Canaiolo, and 20% of other authorized grapes such as Cabernet, Merlot, Syrah etc. 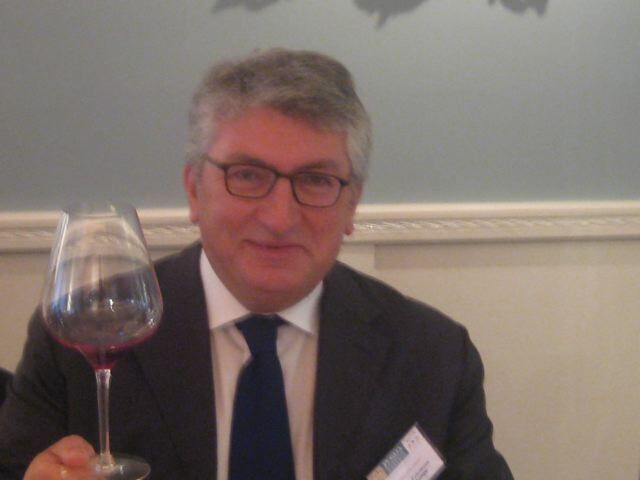 I asked Giovanni if the “new” Consorzio had a symbol and he said that it did not have one and that the old symbol of the Chianti Putto was a thing of the past. One of the subjects that came up was the blend used to make Chianti. Of the wines we tasted most of the panelists seemed to favor the wines that included native grapes and not international ones. Giovanni went as far as to say that Chianti should be made from 100% Sangiovese. He believes that when the Sangiovese 2000 project was completed they were able to single out the best Sangiovese clones. These clones were better and healthier than those used in the past and therefore Sangiovese did not need to be part of a blend but could stand on its own. I never understand why Chianti in straw-covered bottles is always mentioned. 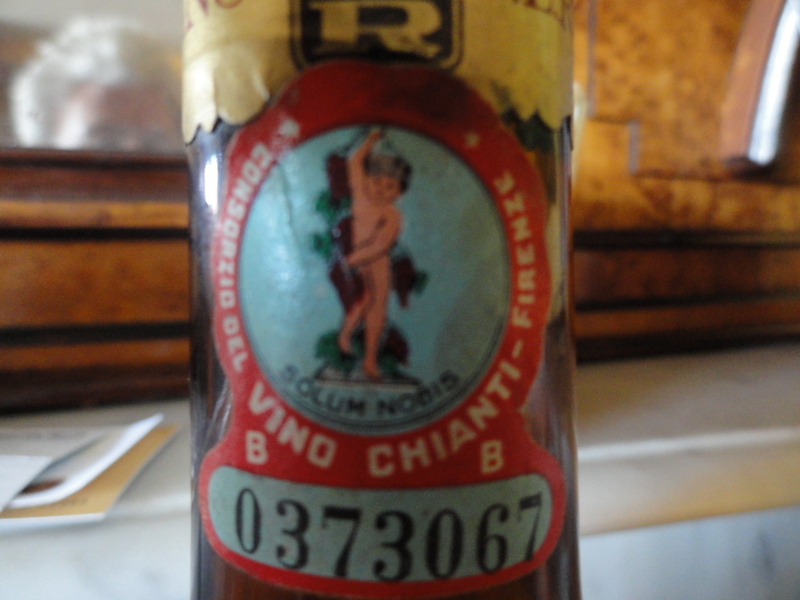 People seem to believe that 40 years ago Chianti only came in this type of bottle, but this is not true. Recently I had a 1964 Villa Antinori and a 1958 Ruffino Riserva Ducale Gold Label and both were in Bordeaux- type bottles. The Ruffino was not a Chianti Classico –the label just said Chianti. All the Chianti I brought 40 years ago was always in a Bordeaux type bottle. It was mentioned that Chianti in the past was made using the “governo method” (10% of the grapes, usually Canaiolo, were dried) and because of this it would not age and did not make a good wine. I disagreed. The 1947 and 1958 Ruffino Gold Label were made with the governo method as were a number of other old wines which are still drinking today. One of the reasons it is no longer done was that it was too expensive and “old fashioned”. 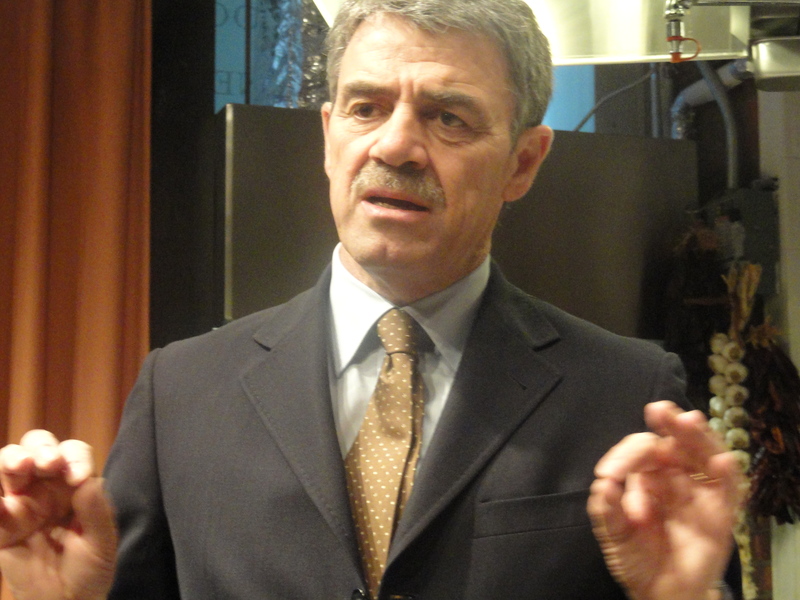 Giovanni said that the new clones of Sangiovese that they are using now are so much better that there is really no need to use the governo method. 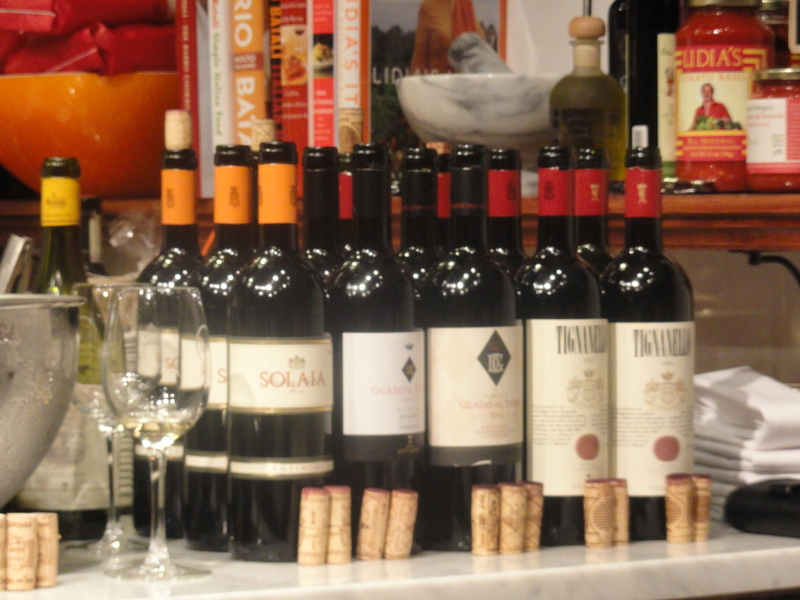 All of the wines were Riservas from the 2007 vintage. 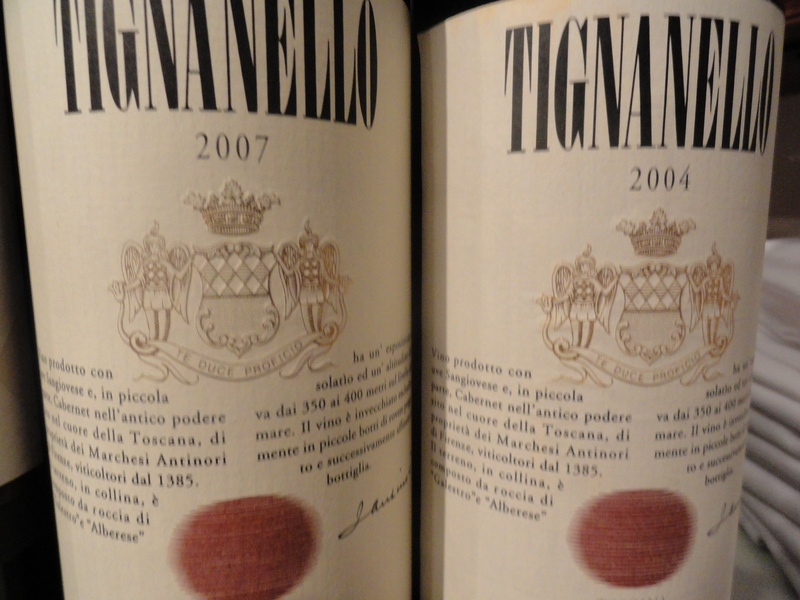 2007 was a very good year in Tuscany right after 2001 and 2004. The number of bottles produced by each producer was very low, ranging from 3,000 to 20,000 bottles. If I understood Giovanni correctly the Riserva has to be aged for 18 months, and 6 of the months in wood. The price of the wines because they have the sub-zone on the label and are also Riservas are more expensive than a wine with just Chianti on the label, would be between $20 and $30. The only retail price that we knew was the Travignoli at $28 because the importer was on the panel. I agreed with the panel that the best wines were those made from with the local grapes. Some of the wines were aged in cement tanks, which might be making a comeback. 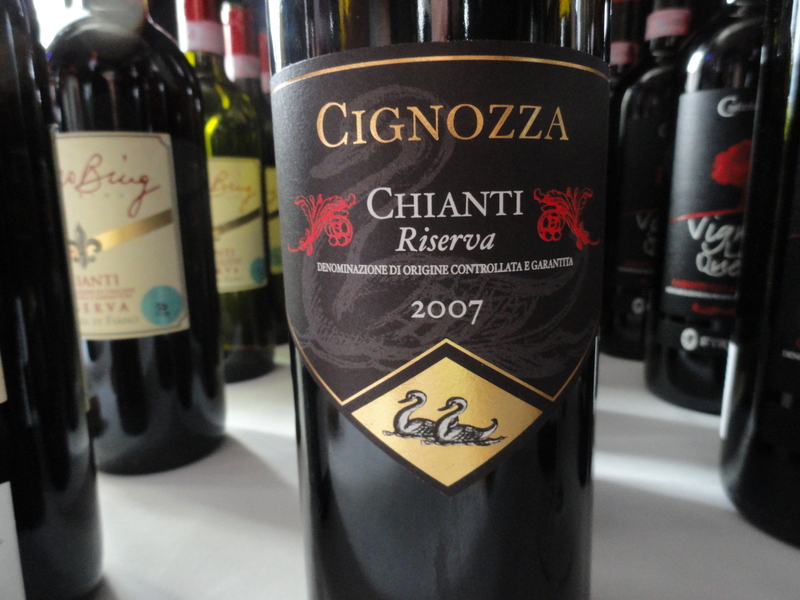 Chianti DCOG Riserva 2007– Az.Agr. Corbinelli The vineyards are located in the Certaldo/Montespertoli area. The wine is a minimum of 80% Sangiovese and other approved red grapes. Fermentation is on the skin for fifteen days. The wine is aged for 12 months in cement tanks and for three months in bottle before release. For this wine there is no wood aging mentioned and the total aging is 15 months-3 months less than the law allows according to Giovanni. One panel member said that the producer must have left out the three months in wood on the tasting sheet. Is it 3 months in wood or 6 months in wood- this was not made clear to me. 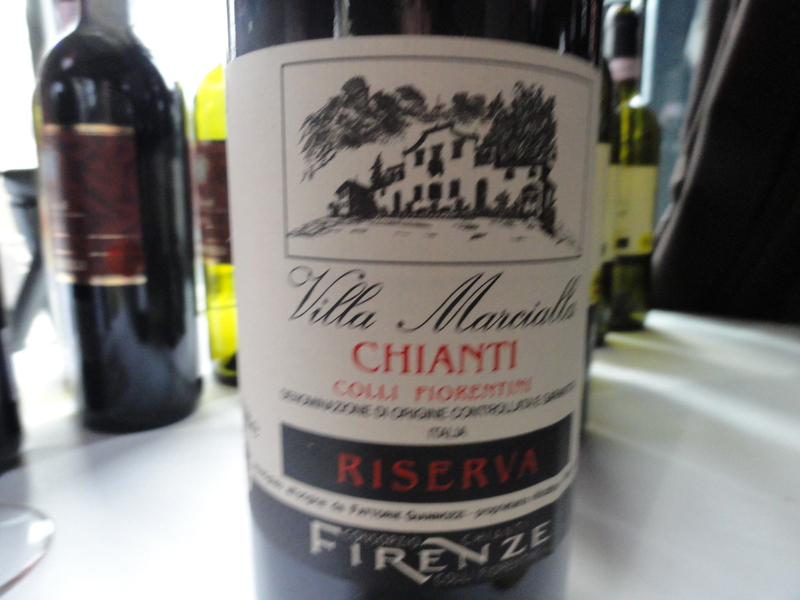 Chianti Colli Fiorentini “Villa Marcialla” DOCG Riserva 2007– Fattorie Giannozza The vineyards are in Marcialli and the wine is 90% Sangiovese and 10% Merlot. Fermentation takes place for 3/8 days. Maceration for about 15 days is stainless steel tanks. 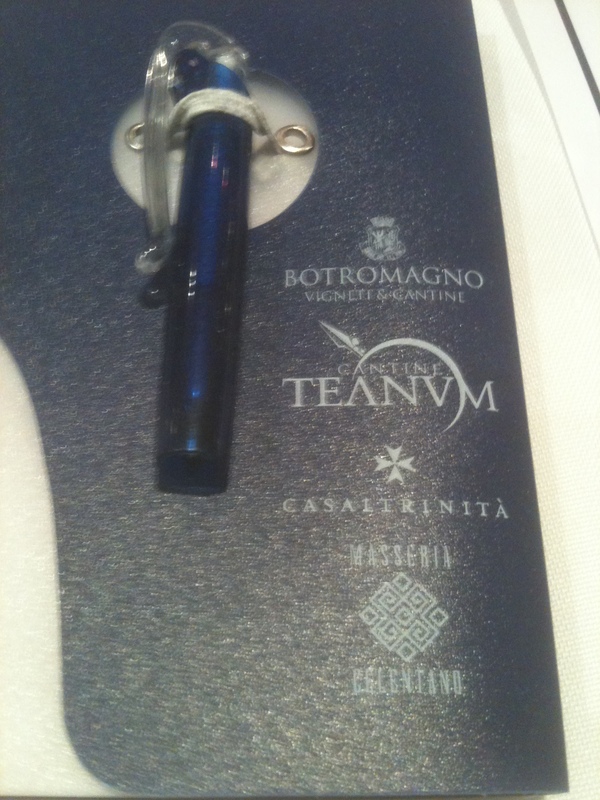 The wine is aged in big oak barrels (botti) for 26 months and 6 months in bottle before release. 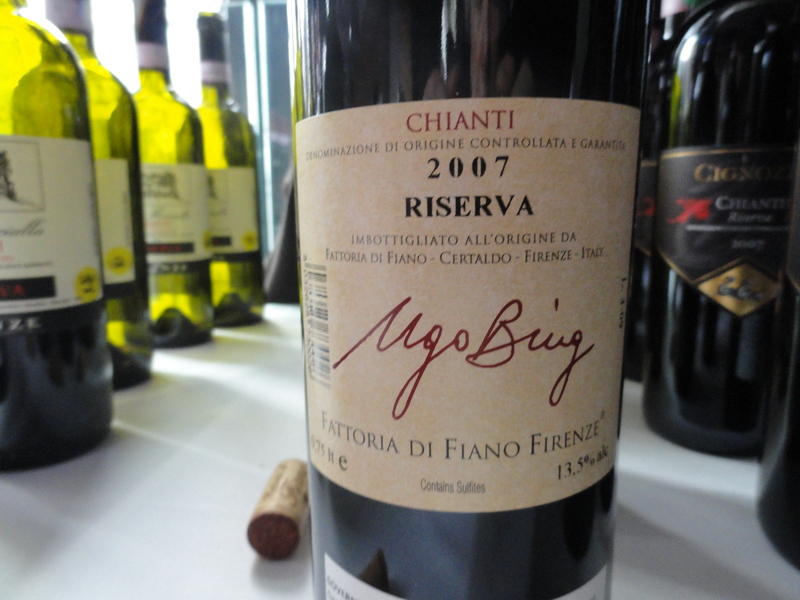 Chianti “Ugo Bing” DOCG Riserva 2007– Fattoria di Fiano The vineyards are in Certaldo, Loc. Fiano and are between 200/300 mt above sea level with a South-East/North-East exposure. The grapes are Sangiovese,Canaiolo, Merlot, Colorino and Syrah. Traditional fermentation with pumping over and delestage – 7/9 days. The wine is aged in 27hl cement vats and barrels. Chianti “Cignozza” DOCG Riserva 2007- AZ, AGR. La Cignozza di Roberto Del Bruno. Location of Vineyards, Chianciano. 80% Sangiovese and 20% Canaiolo. They only produce Riserva during the best vintages. Fermentation takes place in stainless steel tanks for about 12 days with three pump-overs a day. Because of the density, the pump over is then substituted by the delestage (empting and refilling the tank). The juice is then left to settle in stainless steel tanks. After malolatic fermentation 50% of the wines is aged in tonneaux barrels to mature between January and February and the rest in large oak barrels for 24 months. It remains in the bottle for 5 months and is then released. 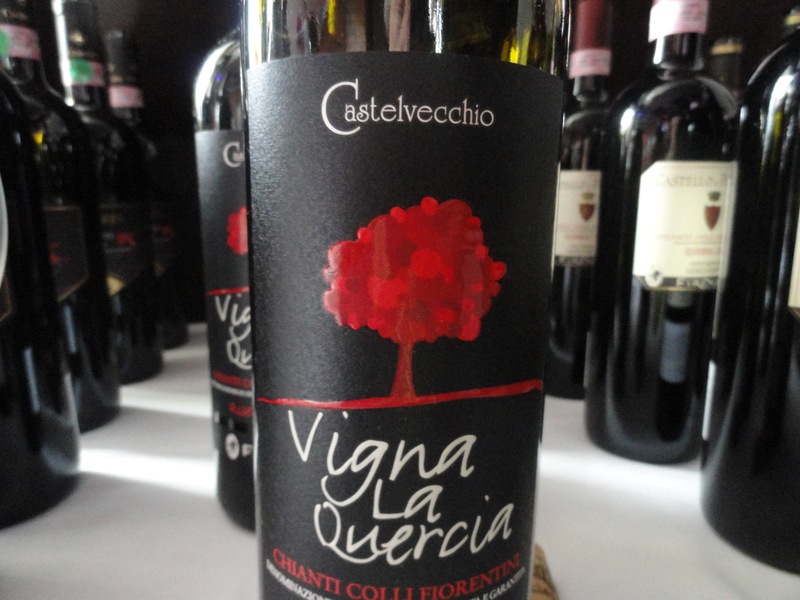 Chianti “Vigna La Quercia” Colli Fiorentini DOCG Riserva 2007– AZ. AGR. Castelvecchio. Location of the vineyards San Casciano Val di Pesa. The wine is 90% Sangiovese and 10% Cabernet Sauvignon. Maceration for 48 hours and fermentation at controlled temperature for 15 days. The wine is aged in oak barriques for 12 months and another 12 months in bottle before release. 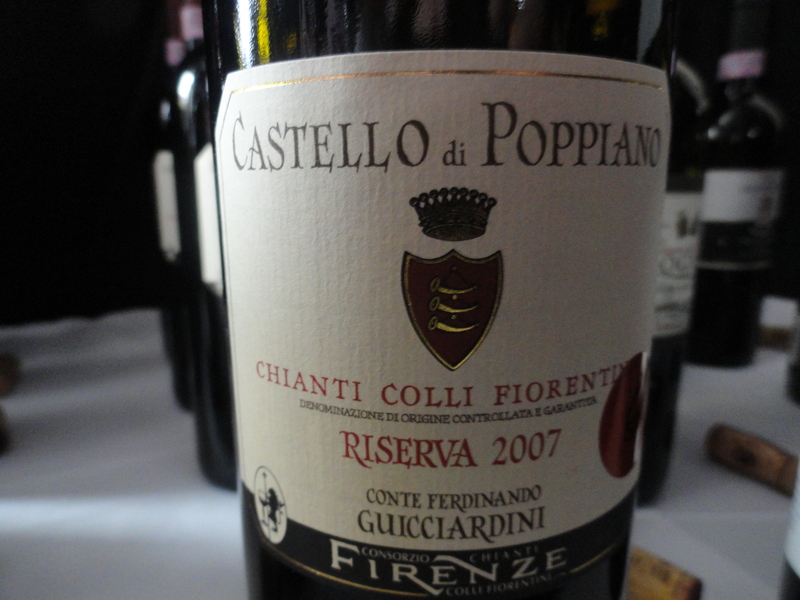 Chianti Colli Fiorentini DOCG Riserva 2007– Castello di Poppiano Guiccardini. Location of vineyards, Montespertoli. 75 % Sangiovese, 20% Melo Cabernet and 5% Canaiolo. Fermentation in stainless steel vats and skin contact for 18 days. The wine is aged for 18/24 in oak barrels and three months in bottle before release. 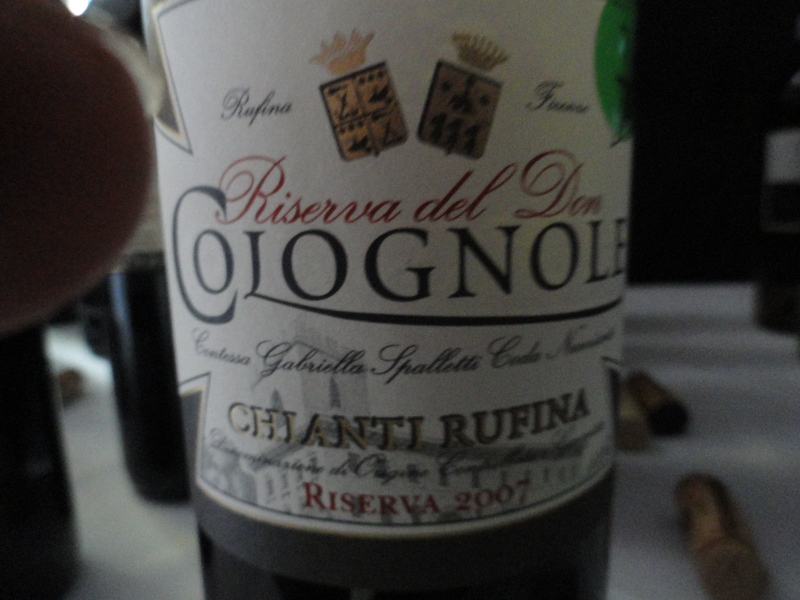 Chianti Rufina “Del Don” DOCG Riserva 2007 Ag. Agr. Colognole. Location of vineyards Colognole (Pontesieve) 100% Sangiovese. There is skin contact for 12/15 days with frequent punching down. 50% is aged in Slovenian and French oak casks 20-30 hl and the rest in Allier tonneau of 500lt. It is aged 18 months in bottle before release. 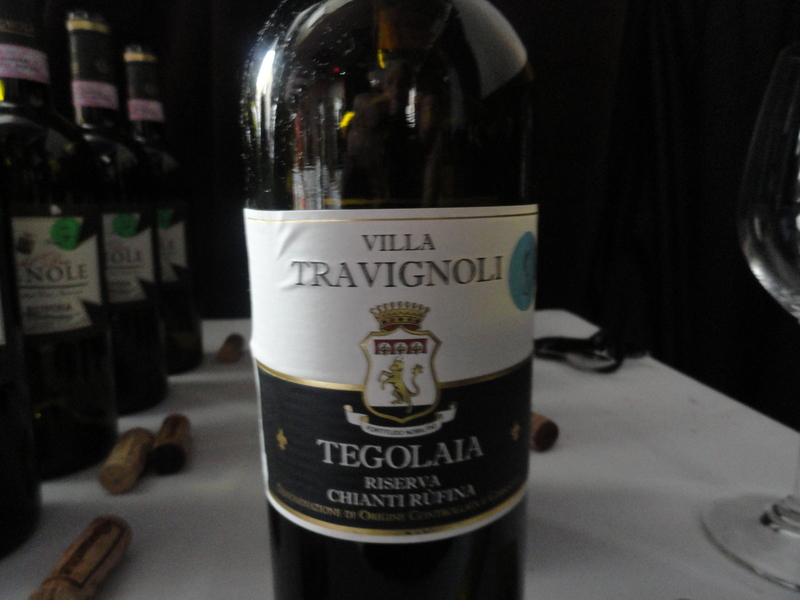 Chianti Rufina “Tegolaia” DOCG Riserva 2007– Travignoli Di Conte G. Busi SRL Location of the vineyards, Pelago 100% Sangiovese. Fermentation in stainless steel for 20 days. The wine is aged in oak barrels of 2,500 liters for 18 months and for 8 months in bottle before release. Sometimes we like to invite friends on a Sunday for a combination late lunch and early dinner. We begin at 4PM so that we are able to take our time eating and drinking well into the night. I don’t know why this type of meal hasn’t caught on the way brunch has. Maybe it’s because “linner” sounds more like something from the dry cleaner than a meal. The rule of thumb for wine service at any meal is one bottle of wine less than the number of guests, which I feel is the perfect fit. Like all rules, this one is made to be broken and we often go to one bottle per person, not counting grappa, etc., depending on the guests. This time was no exception. The food, the wine and the company could not have been better and we did eat and drink well into the night. There were six wines altogether and two very interesting “after dinner drinks” to end the meal. 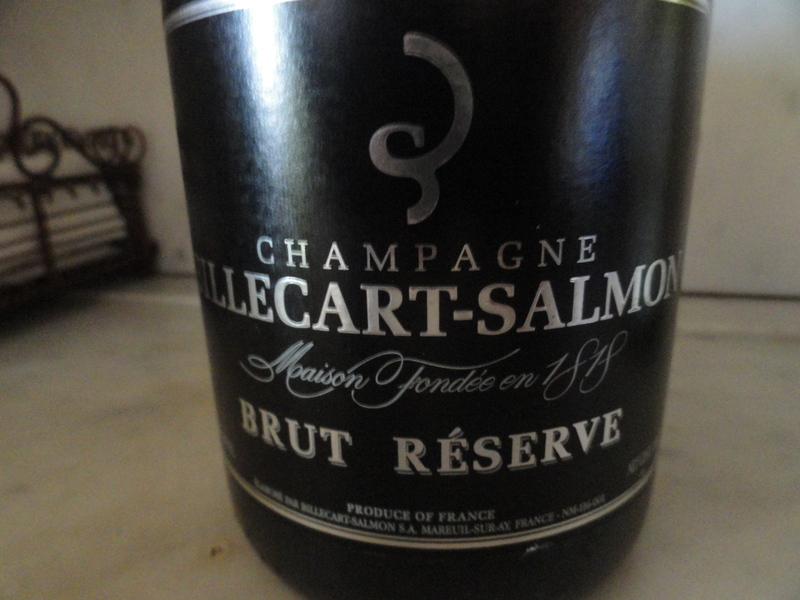 Billecart-Salmon Brut Reserve NV made from 40% Pinot Meunier, 30% Pinot Noir and 30% Chardonnay from three different years and the majority of the base wine is from the 2005 vintage. It had full fruit, clean with hints of citrus, flowers and slight mineral character. Ferrari Centanni 1902/2002- Millesimo 1995-Sboccatura 2002 Method Classico(Trento) The winery was founded in 1902 by Giulio Farrari. The wine is from the 1995 vintage and it was released in 2002. This bottle is, I believe, a replica of the one used in 1902. The “punt” is not a push up but a push down so the bottle cannot stand and has to be on its side. This was a big rich and toasty wine with a great finish and aftertaste. There was some doubt that this wine might not show well but it did. It was showing its age but still had all the aromas and flavors of a wonderful white Burgundy. 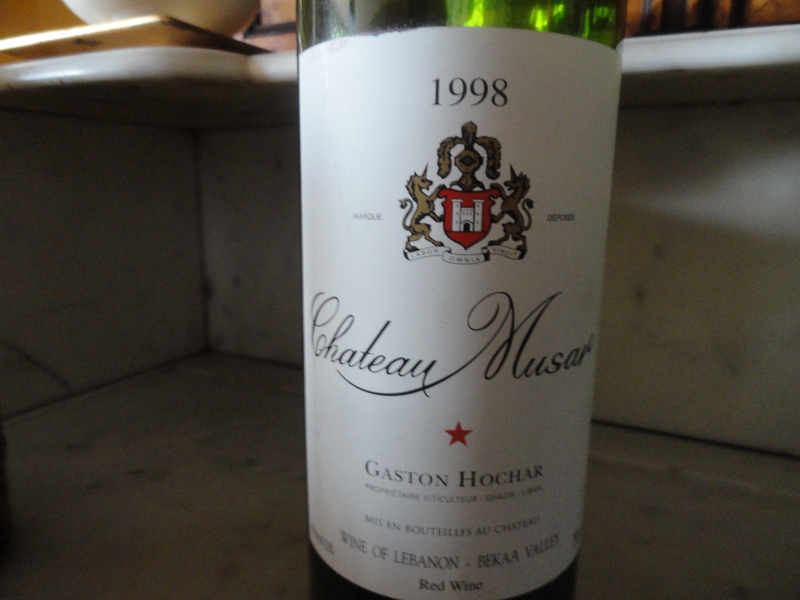 Chateau Musar 1998– Lebanon-after fermentation, maceration is for 2/4 weeks and the wine is aged in Bordeaux type barrels of Nevers oak for 12/15months. At the end of the second year blending takes place with the proportions of Cabernet Sauvignon, Carignan and Cinsault varying with each vintage, the only deciding factor being taste. It is blended in the third year before being bottled and is aged in the cellar for 3/4 years. The wine is released after seven years. The grapes are grown in gravely soil with a limestone base in the Bekaa Valley. The grapes are hand picked. The wine is not fined or filtered and there are no chemical additives with the exception of the minimum dose of sulfur. The clay soil is rich in limestone with sandy veins. The Pora vineyard is at 300 meters with a south to south east exposure. The grapes are handpicked and placed into small baskets. Fermentation is in stainless steel vats for 2/3 weeks. Maceration is 18/20 days and then the wine is aged for 36 months in 20/50 hl oak barrels. It remains in bottle for another 8 months before it is released. 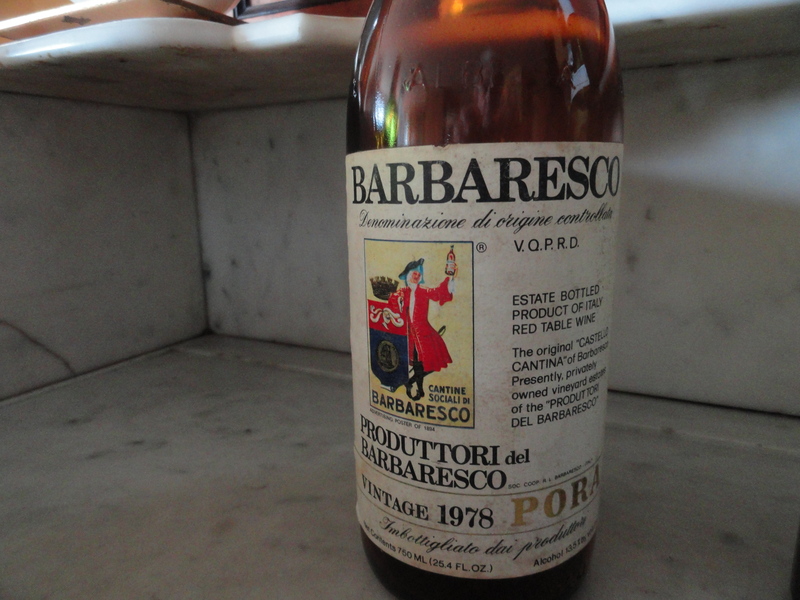 1978 was a great year in Barbaresco. This is classic Barbaresco, more rustic than elegant with hints of cherry, leather, tea and spice. It was drinking very well. This is one of the oldest cooperatives in Italy and it may be the best. The name of the grape growers is written on the back label. 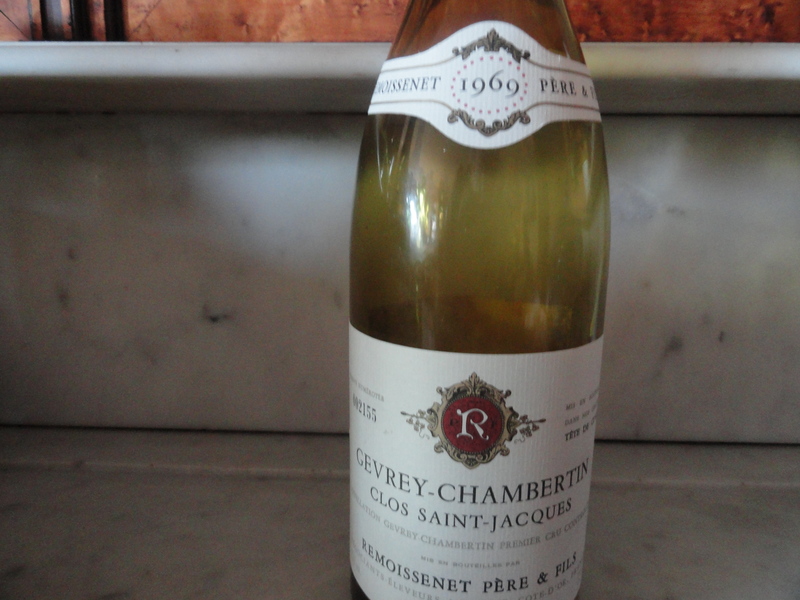 Gevrey-Chambertin Clos Saint-Jacques 1969 Remoissenet Pere & Fils 100% Pinot Noir. This was classic red Burgundy at its best, very mellow and not showing its age. The red wines were complemented perfectly by the Lamb Shanks Osso Buco Style that Michele had prepared in the slow cooker. The year 1942 was not a good year for wine or for the world as it was the middle of WWII. 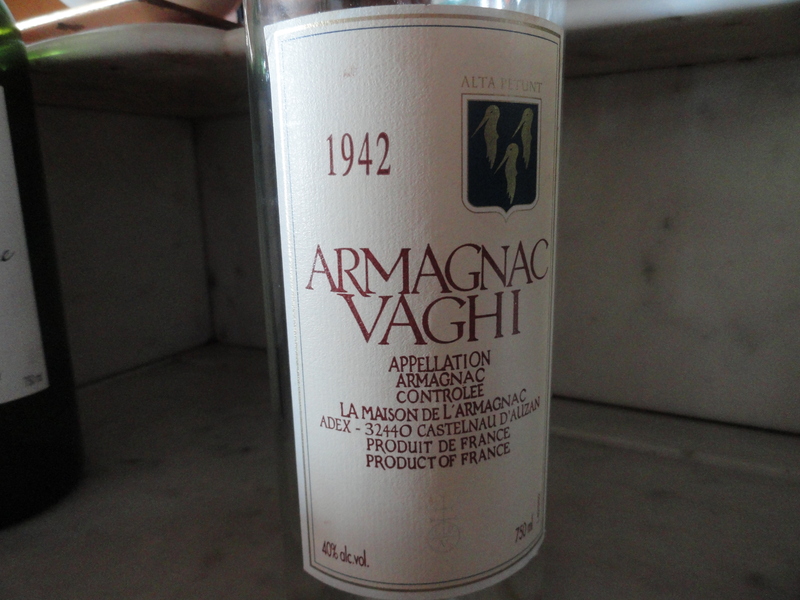 However it was a great year for Armagnac. This was the last bottle and I doubt if I will be buying any more as the price has gone over $600 a bottle. 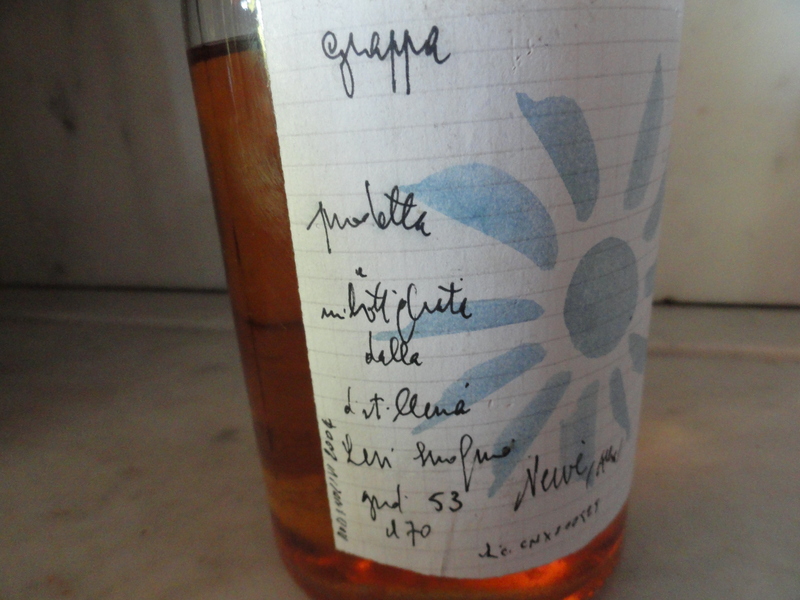 There was only a little of the Armagnac left so I brought out my last bottle of Levi Grappa. The last bottle for two reasons, it is the last bottle that I have and it was one of the last made by the “Angel of Grappa”, Romano Levi, before he died a few years ago.